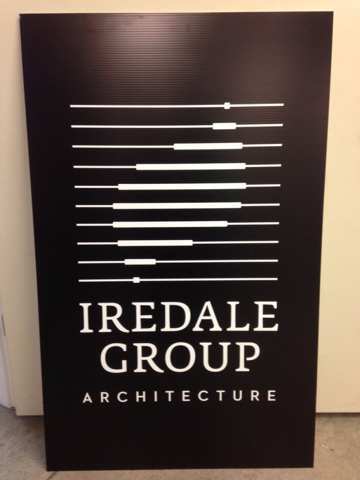 Reduce: The Coroplast sign structure produces superior strength and durability at a lower weight. This enables Simple Sign to offer customers a reliable product, while using less overall material. Reuse: The sheets can easily be reused from sign to sign. Simple Sign offers an all-inclusive service, including a free/optional sign removal service for local signs. Our sign removal makes our customers’ life easier, while allowing us to reuse the Coroplast signs. The result, better customer service and keeping our sign products out of landfills. Recycle: At the end of Coroplast’s useful life, it can easily be recycled. When a Coroplast sheet can no longer be used, Simple Sign ensures that the material is recycled, rather than ending up in a landfill. In all Lower Mainland municipalities it is common to see development signs. Development signs are required to inform the public of a potential development of a property. In the past, development signs were often made with plywood. Plywood is very durable, but it is heavy and more expensive than Coroplast. 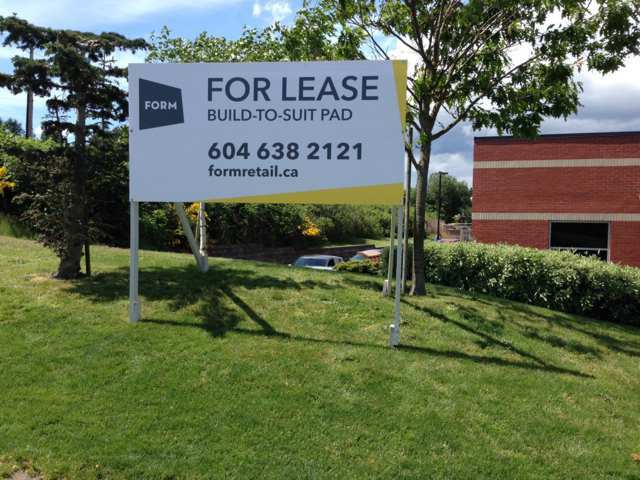 Today, it is common to see Coroplast used for development signs in all Lower Mainland municipalities. 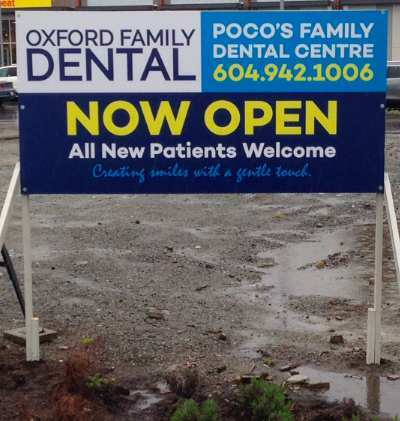 Simple Sign manufactures and installs many development signs for the Lower Mainland and we are very familiar with the guidelines/requirements for each municipality. For more information on the development application process for Lower Mainland municipalities, click the following links: Vancouver, Burnaby, Delta, Richmond, Surrey. 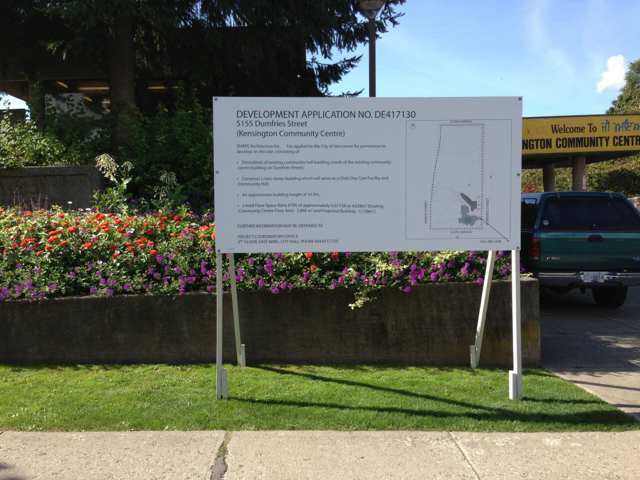 Rezoning signs are very similar to development signs. They inform the public that there is a proposed rezoning of the property by the owner. 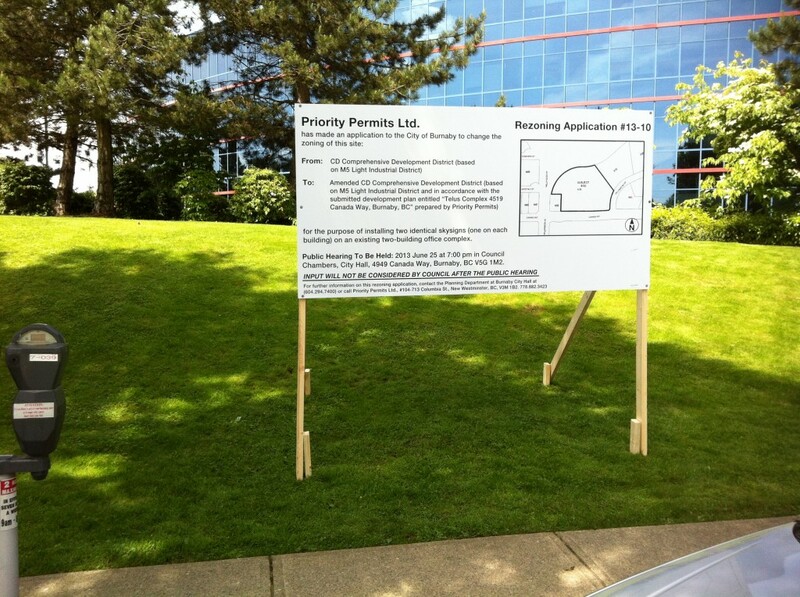 Coroplast is the most commonly used material for rezoning signs. 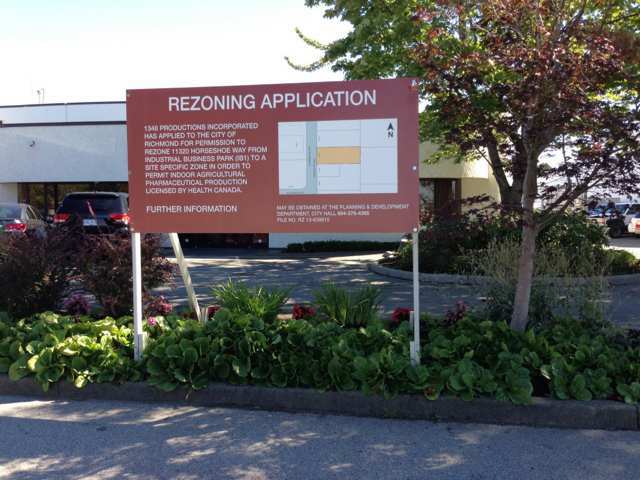 After a rezoning sign is no longer required, the owner will typically throw the sign away. That’s where Simple Sign’s sign removal service is ideal. We reuse the Coroplast Signs and try our best to keep our sign products out of landfills. We drive past commercial real estate signs every day. Whether it be Form Retail, HQ Commercial, or Marcus & Millichap, the choice material for a majority of commercial real estate signs is Coroplast. These signs advertise the sale of a commercial property. 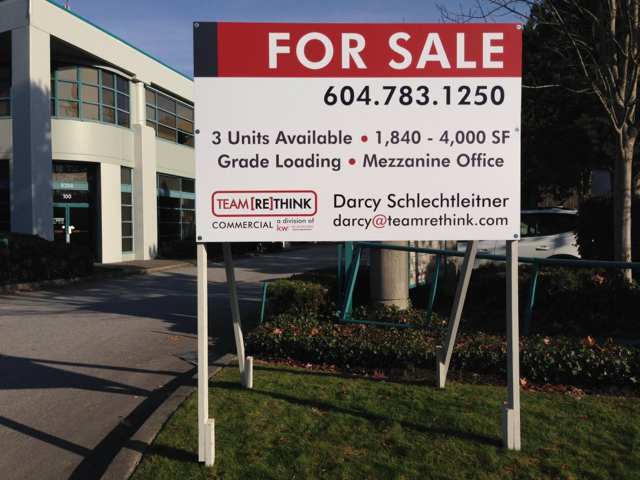 Additionally, the company logos, contact information, and unit sale specifications are often found on these Coroplast signs.For more information on the development application process for Lower Mainland municipalities, click the following links: Vancouver, Burnaby, Delta, Richmond, Surrey. Property management signs are similar to commercial real estate signs. Common dimensions for these Coroplast signs range between 4′ x 4′ and 4′ x 8′. Property management signs advertise retail units that are available for sale and for lease. Coroplast signs are regularly used at construction sites and they are often affixed to perimeter fences. Construction companies use Coroplast signs to display their company logos/contact information, post site rules, and to provide directions for visitors to the construction sites. Coroplast signs can be used by any company to display company logos, contact information, branding, and to bring awareness to a promotion. We encourage any company to choose Coroplast signs and as a cost effective way to advertise and promote their business.